Michael Horn on C2C August 3-4! Will the 21st time be the charm? Plus: ET & Nazi artifacts in Antarctica, The Talmud Jmmanuel, Vaccines & autism, Future of UFOlogy, New defeat of skeptics! 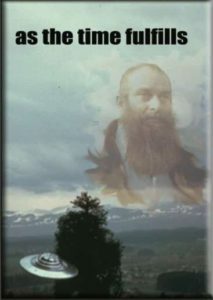 Save 20% on two Billy Meier DVDs! 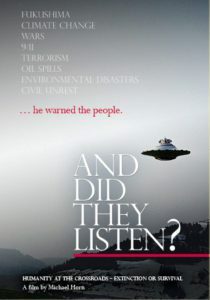 “And Did They Listen?” & “as the time fulfills”…for only $39.95! 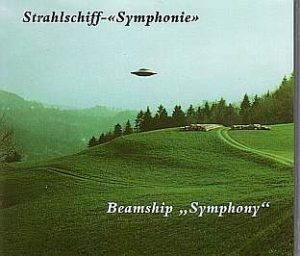 Plus FREE CD: The Beamship Symphony – actual sound recordings of the Plejaren UFOs! For more information about these products click here. *This interview may possibly be heard live online here. Products may come in different cases than images shown. * *To avoid unnecessary panic, we advise against driving through quiet neighborhoods, late at night when people are sleeping, and playing these sounds, at full volume, in your car with the windows rolled down. On behalf of intelligent life throughout the universe, we thank you for your cooperation. Thanks Matthew, I’m hoping the conversation will include that too. Even when the North American continent will be stricken by the most terrible catastrophe which has ever been recorded, evil military powers will wreak havoc with computerised and nuclear, biological and chemical weapons, whereby it will also happen that computerised weapons become independent and cannot be controlled any longer by human beings. Overall, this is the most important part of Henoch’s prophecies. How difficult would it be for a rogue AI weapon system to track and target chip wearing folks? From my previous experiences with electronics and earlier versions of mil RFID chips, I would conclude a rogue AI (with only current technology) would need to be relatively close, approximately within the same city (at best), to obtain a usable signal- primarily due to the ID chip requiring an external interrogation signal to power the return signal. This would still be a triangulation, so the greater the number of “rogue AI’s” the faster and more accurate the tracking would be. Even then there would be substantial reflections in an urban environment and one could probably think of many types of defenses. However if the chip is more advanced and uses something like a low-power GPS (I am not at all up to date on current advancements) then the tracking and targeting process would not be anywhere near as limited. It is also possible that technology has clandestinely advanced far more than is let on, so my first estimate could also be mistaken. The thing is with electronics being ubiquitous and being connected to the internet its actually not as difficult as it would be. The “rouge AI” would use the internet of things (IOT) as an extension that has access to everything you do that’s connected to that key or token embedded in the hand. If a bio-chip is more than an RFID but has an internet connection, then yes of course I agree many things are possible and issues get more complicated. Most people’s conceptions of a nefarious bio-chip are related to mandatory RFID tags of one kind or another, so that’s what I was referring to. Granted NASA actually takes the title seriously, B.E.A.M would be hired immediately. There is an article In The News for 8/2/17 about NASA has a job opening for somebody to defend Earth from aliens? I just saw the tittle but it doesn`t intereast me thanks to the Ps and the kindness to help us grow up with the spiritual teachings. Besides as Semjase has said in the past there are good and bad ETs and even some worlds in the middle too. You have to know who who are the very good nice kind helpful ETs. Most surely you don`t want to hurt those good benevolent ETs, you only want to just get the bad malevolent unhelpful ETs who are only of service to themselves and want to destroy Earth. Somebody should send that message to NASA you DON`T want to destroy all the ETs just because they don`t come from Earth. Not all ETs are bad,only some but not all. I wish NASA would just get it`s head out of the sandbox. Thinking about it, what a perfect way to keep people from learning about the spiritual teachings then keep them chasing lights in the night sky. All of the exopolitic bs speaking tours from people with absolutely no evidence. Look how many are trapped in that vicious cycle. As soon as I’m done with these interviews, I’ll post another example of just how the unrelenting disinformation churns along. Well guess what? Not only are they STILL churning out stupid “Light in the Sky”: but NASA insist on look for like on other world that only have insects,worms,microbial life instead of the more logical rational approach from Billy Meier and more advanced spiritual human beings from another dimension and even MORE advanced human beings from globular clusters around elliptical galaxies that are FAR more stable than the Plejaren Federation,etc,etc,etc! Need Isay anymore? 59:00 -> Randolph Winters claims that Billy had told him that he was Galileo in a past incarnation and also claims that Billy will reincarnate 6 more times here on Earth before returning to the planet where he came from. 1:01:03 -> Randolph Winters says that the Greys share the facilities with the Plejaren. 1:08:35 -> He talks about the Roswell case. 1:14:45 -> Randolph Winters says that both the Greys and the Plejaren allow their spaceships to be photographed in Mexico and also said that the Greys designed and built the triangle delta shaped craft. 1:19:50 -> Randolph Winters talks about the reptilians. The reason why I’m asking is because he claims to have spent some time at the SSSC. If that’s the case then why does he spread nonsense about the reptilians and the alien greys? In my opinion something doesn’t appear to be right about him. What do you make of all this? My time’s limited right now. Suffice it to say that Randy inserted inaccurate, confused information into the material, some self-created, some disinformation he adopted, none of this came from Meier. NOTE: We don’t approve comments from people with fake email addresses, identities, etc. David Wilcock if you are using a fake name and email that is what we as a humanity would call lying and denying the truth. Just seen a new YouTube video of Rob mc Connell and Kevin Randle on C2C both labeling the Meier case a hoax and you basically a crazy person Michael. I take it the 21st C2C show is now off? Ah yes, the video with not too many views where, instead of debating the facts, they do an incredibly poor hatchet job, basically not getting…anything right. Well, maybe that I’m a crazy person but who isn’t? I did the full two-hour show last night, with Noory raving about the authenticity of the Meier case, etc. Maybe someone will post it to youtube. Listened for a while, Tony, but, how much can you listen to two garden gnomes complaining about the rain and what day it is? Those people who try to adamantly debunk the Meier case in a deranged and unhinged manner definitely have an agenda. There is no way a sane, rational, logical and intelligent person could delve into the Meier case and not come to same conclusions we have. It’s just not possible and therefore these people have an agenda to promote or financial interests that steer them away from promoting the case. I have a hard time understanding how anyone could blow this case off as a hoax. Some of these wacko’s at the UFO conventions claim they’ve had hybrid alien children and these people eat that stuff up. Billy provides decades worth of accurate scientific data, photos, videos, metal samples and years of prophetically accurate information and they call him a hoax. Am I missing something here? Lol at Andrew’s comment. She loves to spew the WCUFO being a garbage can lid with absolutely no recollection of what garbage can lids actually looked like back then. Melissa, You should understand that at least 99% of people are not capable to deal with information BEAM and Pleyarans are bringing, so it is easyer for them, before taking the necessary time to study this huge amount of information, which so much differs from their perspective of the world, to simply deny it at the beginnig, the easyest way being labeling BEAM as a fraud. Only those of us who have read enough of it know that no one can just make up stuff like this, with so much advanced information and logic and proof, so it can only be true. Unfortunatelly not many people get that far, by taking the time to study it. Then there are those who simply does not want to except it, because if they would they know they would be proven as frauds and liars, and there are those who fear to lose Status Quo if this knowledge would be known and accepted by the public, then there are large majority who do not have acces to all this knowledge, and there are those that are not even capable to read or even less to understand it or even less to deal with it. This is why this just can not work… all of this has all been long ago explanined in the prophecies and contact reports! McConnell is too busy trying to get the racists removed from Mufon. As if it really matters which bozos work there. Then McConnell can be the hero that he always wanted to be. He gave me bad authoritarian vibes in 2015 and he obviously has no loyalty to the mission. Randle has proven he’s an idiot by his nonsensical rants on his website. Two peas in a popo pod. For the past couple of years he was telling me how he was initially a skeptic but now completely accepts the Meier case and its evidence as authentic. He offered me my own show on his channel and a front page article on his online newspaper. People are very…strange sometimes. So there’s no indication that he’s actually going to follow through? If you mean McConnell, I wouldn’t be interested. He’s shown he has no character. I was…. but from the sounds of it, you’re right that nothing good could come from involvement with them. Hi Michael, finally listened to the old ladies at xzone complaining that you only want to talk about Billy Meier. Randle started out admitting he’s never even looked at the material, lied like a crazy fool and yammered on about predictions he doesn’t know. Rob was scripted, you could tell by his voice on the verge of woman tears for ‘dissing his good buddy Randle. The final part is where they talk about their good friend Kal Korff. They seemed to like the fact Korff infiltrated the Meier home. Instead of being concerned with Kal’s trespassing or using a false identity, he apparently has a stellar reputation. Rob is having Kal on his clown show. He never mentioned anyone else by name, but Rob has decided his guests will prove Meier is a hoax. Weeeeeell, it’s too bad that he freaked out and decided to give the know-nothing Randle the time of day. Randle did the “shoot-first-ask-questions-later” thing, showing he didn’t know what he was talking about. As you said, he even admitted it. This is a perfect example of the utter scam the UFO field is. Here;s guy who babbles on, and writes books, about, Roswell…without even one piece of actual evidence. Yet he attacks the ONLY UFO case that’s not only overflowing with it but the contacts are still ongoing. Just another lazy, intellectually dishonest guy, actually at least two of them now. The only good thing will be more exposure for the Meier case, albeit to a minuscule audience. The questions asked from the two callers at the end of the coast to coast interview is an example of how lost a lot of people are. Of all the things discussed, that’s what they had to ask??? I needed a neck brace after all the head shaking I did. You answered them exactly how I expected. People need to really listen to what’s being said. I really hate this case being associated with the UFO Industry…It’s goes so far beyond the UFO pictures, videos, etc. Great job, once again, MH. But you had another excellent interview with George Noory which I thoroughly enjoyed. 21 was the charm after all. Thanks for the link you gave to Dolly. The coming times are going to get very turbulent and we have a lot of studying to do. I’m really not surprised to see Randle and McConnel so lost in their egos that nothing else matters. Cut them loose. Glad you enjoyed that one, thanks. I hope you enjoy this one too. These two people seemed to be very nice also. Michael, are you really doing these interviews without written references, flash cards, or anything? I’m a bit over halfway through the interview with the two Canadian folks and am also pretty impressed… I’m also very glad to see their taking the info with an open inquisitive minds. Stuart, yes, it’s stuff I remember. Also… I really enjoy the look on the male interviewers face at 1:50 when he finally begins to realize why the fixations on ‘open contact’ and ‘disclosure’ are fruitless at this juncture. Wow, that was an awesome interview. So nice to see open and intellectually honest questions being asked. I hope Beth and Paul do pursue the spiritual teaching. Keep up the great work Michael! That’s enough proof for me to call bull****. Why charge money for something that is soooo real that can possible change how the world thinks about earth/universe? Because its a hoax! I’ve seen all his videos and images with the Cake UFO floating next to the only tree on open fields and they are terrible lol he’s been keeping contact with them since he was 5? Bull f*****t lol yeah when “Mars Attacks the World” came out in 1938 I guess he came in contact with them. You people are so gullible. Ah yes, another genius who “knows” so much. Hey, why charge for water, food, your…clothes, computer, Internet, transportation, education, entertainment, etc., etc.? After all, it should be free. Apparently even though you get FREE internet, it hasn’t helped you to…THINK. Read everything on this blog and at http://www.theyfly.com, if you’re not too lazy, after all, it’s…FREE. BTW, the reason that DVDs, books, etc., cost money is that people like me…nest our own time and money to make them, Of course people like you don’t create anything of value and just feel entitled to what others produce. Did I get that right? Solved! The “Dot in the Sky” UFO!